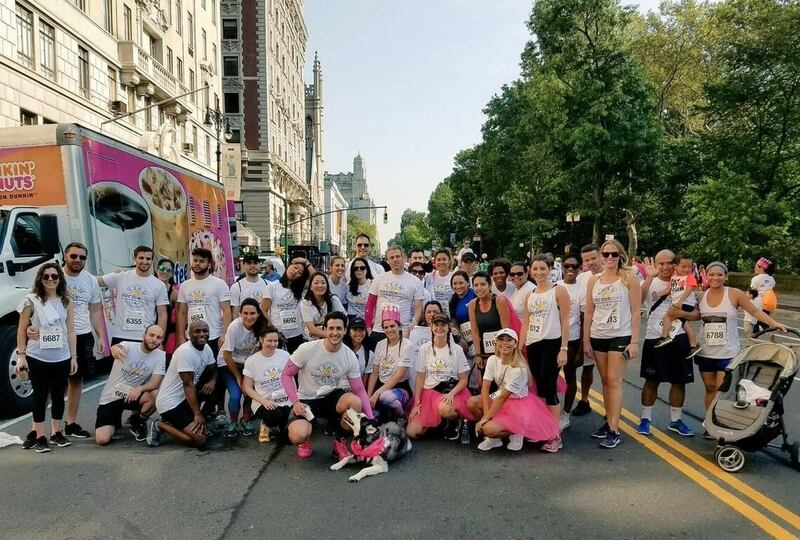 If you’ve got a big 5K race coming up, creating custom t-shirts for your group or team is the perfect way to boost everyone’s spirits and raise some funds! Plus, when your whole group of friends, family, or coworkers presents a united image by all wearing the same well-designed event t-shirt from Bonfire, you’ll look great and catch everyone’s attention. 5K races are a classic team fundraising event, and nothing goes as well with fundraising as custom t-shirts. Whether your team is simply participating in a fundraiser 5K or if your organization is actually hosting it yourself through a peer-to-peer fundraising platform or another website , t-shirts can make a smart addition to practically any kind of campaign. Create the perfect custom race shirt design to unite your running group. Choose t-shirt styles and colors that make sense for your 5K. Order the right sizes of custom race shirts for your 5K running team. Make sure everyone wears their custom race t-shirt for the 5K. Creating a sense of unity among all your team members is a perfect way to boost team spirit and give everyone a perfect souvenir of the experience. Make sure you get the whole process just right to be the hero of your next 5K! 1. Create the perfect custom race shirt design to unite your running group. Creating a striking design that sums up your group’s passion and catches the attention of both bystanders and other runners can be a challenge, but the payoff will be significant. First, determine exactly why you want custom t-shirts. Is the entire 5K part of a larger peer-to-peer fundraising campaign? Does your team want to raise awareness and funds for their own particular cause? T-shirts make a perfect fundraising item. Or does your team simply want a custom t-shirt of their own to stand out from the crowd? It’s just as easy to design and bulk order custom shirts, too. Draft the perfect slogan for your team. Create an illustration of a mascot that represents your team. Pick a single word that sums you up, like the neighborhood you all share. Choose the color that best represents the spirit of your running team. Once you have a concept and are ready to start designing your custom race shirts, be sure to browse some resources for visual inspiration. There are tons of ways to create interesting, trendy, and effective layouts for t-shirts. Check out Bonfire’s Instagram page for a curated collection of some top shirt designs! Next, use Bonfire’s intuitive design tool to upload illustrations, test out different colors, and fine-tune a design that perfectly symbolizes your 5K team! As you design your new shirt, think about how your design can best capture why your team loves running together. Get a teammate or two involved in the design process, but let it be a fun surprise for most of the team! That’s the best way to use your custom t-shirts to boost team spirit and make everyone’s day. 2. Choose t-shirt styles and colors that make sense for your 5K. Regardless of whether or not you’ll buy all your custom t-shirts at once or sell them online for your teammates to purchase individually, it’s very important that you consider exactly what style and color of shirts you should offer. What season or time of year is your 5K? Where do you and your teammates live? What do your teammates typically like to wear while running? 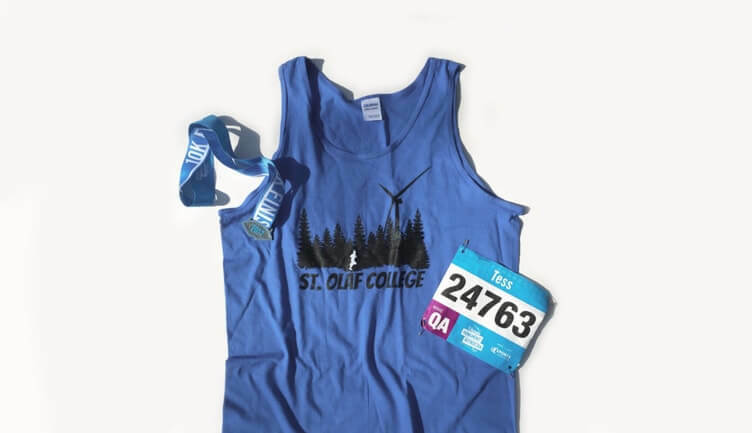 For instance, if your 5K is in the middle of the summer, tank tops might be the best choice. A fun run on a winter day might call for sweatshirts! Or maybe your team has already decided that classic crewneck t-shirts will get the job done. Plus, Bonfire’s products come in up to 17 different colors! Once you’ve created your perfect design for your 5K shirts and chosen a product to print it on, test out a few different colors in the design platform. Choose the color that looks best with your design, represents your running team’s spirit, or is the most eye-catching. Choosing a unique color is a great way to differentiate your team, too! One best practice to keep in mind is that darker designs tend to look great on lighter-colored clothing and vice-versa. 3. Order the right sizes of custom race shirts for your 5K running team. If you choose to directly purchase a batch of your custom t-shirts to distribute to your running team, be sure to gauge an accurate number of which sizes to order! Supply by Bonfire makes a great choice if this is the route your team decides to take. After designing your custom shirts and choosing products and colors, place an order for as many or as few shirts as you need in any sizes. By creating a simple t-shirt order form to distribute to your running teammates, you can make the whole process even easier. Let them record the sizes and quantities that they’d like. Alternately, you might choose to streamline the entire process by letting your teammates order their own race shirts online. This removes the hassle of individually collecting information and funds, but it does require you to more actively promote your custom t-shirts and ensure that every teammate orders one in time for the big race. 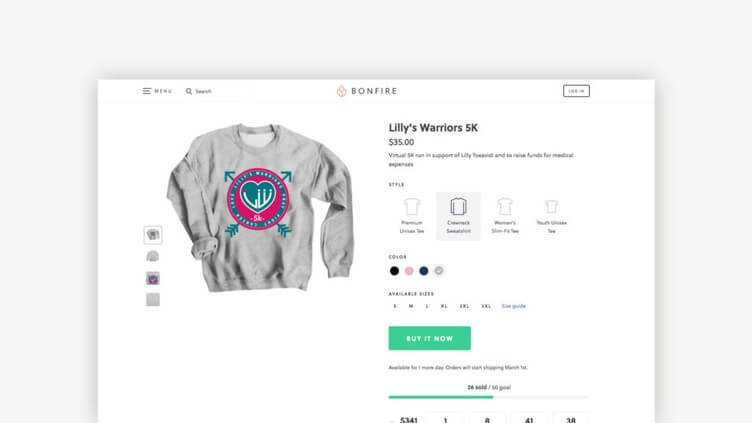 Bonfire’s campaign structure makes it easy to promote your shirts and even easier for your teammates (and other neighbors, family, or co-workers!) to order them online. Even once you reach your goal and receive your shirts, the campaign can automatically reopen whenever a new member of your running group wants their own t-shirt, too! 4. Make sure everyone wears their custom race t-shirt for the 5K! You and your 5K running team might want custom t-shirts for any number of reasons. Maybe your team is participating as part of a larger fundraising campaign or online peer-to-peer fundraiser, or maybe you’re just avid runners who share a passion! Either way, promoting and marketing your cause is easy with custom t-shirts. Regardless of why you create and order custom race shirts for your running group, everyone can benefit from wearing and promoting them on race day. Encourage every participant to wear theirs on race day. Have a couple extra shirts on hand, just in case. Take plenty of photos of your whole team before and after the race. Share the photos on your group’s social media pages or individually. Show off the perfect design you created! Even if your running team is unaffiliated with a fundraising campaign or nonprofit organization, you might be surprised at the number of other individuals who might be interested in getting a shirt of their own. Your family, friends, co-workers, and neighbors might want to support your group, especially if your design does a great job of symbolizing your community or company. 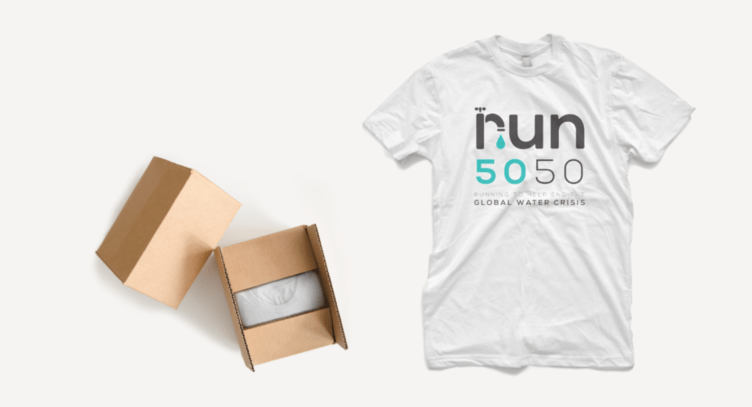 You can continually raise enough money with your t-shirts to supply the team with bottled water for every race, or maybe you can even treat everyone to a well-deserved round of beers! Offering your custom shirts through Bonfire is the perfect way to let anyone purchase one. If your 5K team runs for charity, offering t-shirts this way is a great fundraising idea! If your running team has a 5K coming up, custom race shirts are a smart move! If you design them carefully and make use of Bonfire’s smart tools, not only will they look great and boost team spirit, they’re also a fantastic opportunity to raise some funds for your cause or group. Our list of the best fundraising websites. Consider hosting your own 5K or fun run through a peer-to-peer fundraising platform or another website! Fundraising Ideas for Cancer Treatment and Awareness by Fundly. Raising money for cancer research is an extremely popular cause that brings people together for 5Ks. 45+ School Fundraising Ideas from Funds2Orgs. Check out this comprehensive list of unique ways to raise money for any grade level! Are you ready to create a custom race shirt?